The Bishop of Salisbury has instituted the Rev. Spencer Compton Spencer-Smith, M.A., to the vicarage of Kingston, recently severed from Corfe Castle, Dorset. A MEETING of the members of the Kingston Reading Room took place in the school house, on Friday evening, for the purpose of hearing some practical Readings from various authors by O. W. Farrer, Esq., of Encombe House. Mr. Farrer’s reading was very impressive and afforded unmixed pleasure and gratification to his audience. We trust this is only the beginning of many such intellectual treats. They undoubtedly have a most harmonizing effect, and will bear to be repeated. Lord Eldon met with a severe accident on Friday last, whilst shooting in his preserves at Encombe in this county. His Lordship was in the act of loading his gun, when by some means the powder ignited in his flask, which blew up, and severely injured his right-hand and wrist. Yesterday morning at 11 o’clock, the mortal remains of Sir John Scott, Earl of Eldon, were removed from his mansion in Hamilton-place, Piccadilly, for internment in the catacomb attached to the church of the parish of Kingston, in Dorsetshire. LAW OFFICERS OF THE CROWN. The Lord Chief Justice of the Queen’s Bench. The Lord Chief Justice of the Common Pleas. The Lord Chief Baron of the Exchequer. JUDGES OF THE COURT OF QUEEN’S BENCH. JUDGES OF THE COMMON PLEAS. The Accountant-General (W. Adam Esq.) and the Masters of Her Majesty’s High Court of Chancery. The Right Hon. Sir John Nicholl. The Right Hon. Sir Robert H. Inglis. The Right Hon. Sir Charles Wetherell. The Right Hon. Sir J. Gaselee. Sir Moses Montefiore, Sheriff at the City of London. The noble Earl, being a freeman of the Merchant Tailors’ Company, the Master and four Wardens attended. The Master, J. Allister, Esq. First Warden, R. Jennings, Esq. Third Warden, R. Pugh, Esq. Fourth Warden, J. Smart Esq. The carriages left the procession on its arrival off the stones of Kensington. The cavalcade was to rest last night at Bagshot; this evening at Winchester; tomorrow at Wimborne in Dorsetshire; but, from the state of the roads, it is anticipated that it will not arrive at Encombe-house before the afternoon (about half-past 4) of Thursday. The body will then lay in state, and on Friday at noon the funeral will take place in the presence of some portion of his Lordship’s family, friends, domestics , the tenantry on his Lordship’s estate, and the neighbouring nobility and gentry. Encombe is seated in a very deep vale, that opens to the British Channel on the south, and is about a mile and a half south-west from Kingston. It seems to take its name from its situation on the extremity of the island of Purbeck, i.e. End-Comb; or, according to Hutchins, from its situation in a Comb or Vale, In-Comb. This estate is one of the best in the island, consisting of arable and pasture, and has, from its fertility, been distinguished by the name of the Golden Bowl. It yields a greater plenty of grass, and more beautiful verdure, than is usually seen in this island. It is conjectured that this Manor and Hamlet belonged, in ancient times, to Shaston Abbey. In the 32d year of Henry VIII., it was granted to John Lord Zouch, who at the same time had license to alienate it to Sir Thomas Arundel, Knt., and his heirs. After the attainder of Sir Thomas in the 6th year of Edward VI., this Manor and that of Remmescomb were granted to John Bourchier, Lord Fitzwarren, to be held in chief by service of the fortieth part of a fee; and in the same year he had license to alienate Encombe to Robert Culliford and his heirs. In 7th Edward VI., it was granted to Margaret, wife of Sir Thomas Arundel, in confirmation of her dower for life. But this does not seem to have taken place, for it was ever after the property and seat of the Cullifords, a family that came out of Devonshire. William Culliford, Esq., Commissioner of the Customs in Scotland, died without issue in 1723, and was succeeded in the possession of Encombe by his brother Robert, who died in 1728. 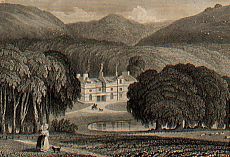 In the 7th year of George II., an act was passed for the sale of this Manor and Farm; soon after which it was purchased by Mrs. Lora Pitt, who gave to her second son, John Pitt, Esq. : from him Encombe came into the possession of his son, William Morton Pitt, Esq., who, a few years back, disposed of it to its present noble owner. The ancient seat of the Cullifords being much decayed, was entirely pulled down about 1734 by Mr. Pitt; who on the same spot erected a most elegant Mansion of Purbeck stone, laid out the grounds with great taste, and made extensive plantations. It has a fine view of the British Channel, and is esteemed one of the most beautiful and romantic situations in this part of the kingdom. The facade of the building, as seen in the annexed Plate, presents a centre with two wings. Each wing consists of two sections; the roof of one having gables with globular ornaments; the other bordered with an embrasured parapet. The wings are joined to the centre by a short corridor, having in front four columns of the Doric order. John Scott, Earl of Eldon, Viscount Encombe, of Encombe in the county of Dorset, and Baron Eldon, of Eldon in the county of Durham, was born on the 4th of June, 1751, at Newcastle-uponTyne, in which place his father carried on the business of a merchant. Applying himself to the study of the law, his Lordship was admitted a member of the Society of the Middle Temple in 1772, and rose through the different gradations of office to its highest honours. Lord Eldon was called to the bar in 1776; elected Member of Parliament for Weobly in 1783; appointed Solicitor-General and knighted in 1788; Attorney-General in 1793; Lord Chief Justice of the Common Pleas in July, 1799, and at the same time raised to the Peerage by the title of Baron Eldon. His Lordship was, in 1801, appointed Lord High Chancellor of Great Britain: this high office he resigned in February, 1806, but was re-appointed in April, 1807. Upon the demise of the late King, George III., his Lordship delivered up the great seal into the hands of His present Majesty, who was graciously pleased to entrust it again to his Lordship’s custody; and on the 6th July, 1821, as a further mark of royal approbation, His Majesty was pleased to advance him to the dignity of Viscount Encombe, in the county of Dorset, and Earl of Eldon. On the 1st of May, 1827, Lord Eldon once more resigned his office of Lord High Chancellor, after having held that distinguished post nearly twenty-five years, a far longer period than any of his predecessors. As long as sterling ability, strict integrity, and impartial decision, are considered as the distinguishing characteristics of a sound Lawyer and conscientious Judge, so long will the name of Eldon conspicuously shine forth. As a principal member of the administration of public affairs, during one of the most eventful and glorious periods of English history, his Lordship has a peculiar claim upon the gratitude of his country, which all good men, and sincere friends to our present constitution in church and state, will readily acknowledge. Encombe is a favourite residence of its noble possessor; and here at intervals, removed from the busy scene of official life, his Lordship was accustomed to relax his mind and to recruit his health. Lord Eldon married Elizabeth, daughter of Aubone Surtees, of Newcastle-upon-Tyne, Esq., by whom he has issue. His grandson, John, commonly called Viscount Encombe, is his Lordship’s successor.